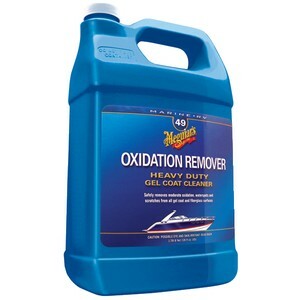 Meguiar's Oxidation Remover is engineered to remove moderate oxidation, scratches, stains and tough water spots from your boat's fiberglass gel coat and painted surfaces. Meguiar's Oxidation Remover is engineered to remove moderate oxidation, scratches, stains and tough water spots from your boat's fiberglass gel coat and painted surfaces. Great for restoring color by effectively removing surface degradation.